Salam al-Marayati, the founder of the Muslim Public Affairs Council (MPAC), was chosen to represent the United States government at the OSCE meeting this week in Warsaw. This is not really surprising, given the evident esteem in which President Obama holds the Muslim Brotherhood. MPAC’s public advocacy often involves defending accused terror financiers and opposing law enforcement efforts to root out terrorists and their enablers. To download IPT’s comprehensive report on MPAC, click here (pdf). A Muslim leader who said that Israel should have been added to the “suspect list” for the Sept. 11, 2001, terrorist attacks was recently selected to represent the United States government at a human rights conference sponsored by the Organization for Security and Co-operation in Europe (OSCE). Salam al-Marayati, founder of the Muslim Public Affairs Council (MPAC), was chosen by the Obama administration to deliver remarks in Warsaw, Poland— home to one of the largest Jewish ghettos during the Holocaust—during the OSCE’s Human Dimension Implementation Meetings (HDIM), a 10-day gathering meant to foster the “promotion of tolerance,” according to the group’s website. Al-Marayati was selected to participate in the confab by the U.S. delegation, which was led by Ambassador Avis Bohlen, a Georgetown University professor and former Clinton administration official, according to MPAC’s website. The selection of al-Marayati, who has drawn criticism for defending terrorist acts and blaming Israel for 9/11, raised concerns among some observers, who deemed his presence at the human rights meetings offensive. “It is inexplicable that a person who blamed Israel for the 9/11 attacks and advocated for terrorist organizations, including Hamas and Hezbollah—which has killed more Americans than any terrorist group in the world except al Qaeda—was chosen to represent the United States,” said Josh Block, a former Clinton administration official who now serves as CEO of The Israel Project, a pro-Israel educational group. Al-Marayati drew widespread criticism from Jewish leaders and others when he said that the U.S. “should put the state of Israel on the suspect list,” according to the New York Times. “If we’re going to look at suspects, we should look to the groups that benefit the most from these kinds of incidents, and I think we should put the state of Israel on the suspect list because I think this diverts attention from what’s happening in the Palestinian territories so that they can go on with their aggression and occupation and apartheid policies,” al-Marayati told a radio host, according to the Times. Al-Marayati has also defined attacks by the terrorist group Hezbollah as “legitimate resistance,” according to a report by the Investigate Project on Terrorism. He was invited to participate in the conference as a “public member of the U.S. delegation,” according to MPAC. “Al-Marayati was invited as a public member of the U.S. delegation to HDIM along with Professor Ethel Brooks of Rutgers University and Nida Gelazis of the Woodrow Wilson Institute,” MPAC said in a statement. During his remarks before OSCE participants, al-Marayati said that “hate speech that intends to degrade, intimidate, or incite violence against someone based on religion is harmful,” according to a portion of his speech posted on MPAC’s website. The U.S. Embassy in Poland also praised al-Marayati’s presence. One official with a Jewish organization said the embassy’s statement was tone deaf, and demanded the Obama administration explain itself to the Jewish community. Ambassador Bohlen, the U.S. delegation’s leader, served in the government for nearly 30 years, including in the State Department. She also served as the ambassador to Bulgaria during the Clinton administration. Bohlen currently serves as an adjunct professor at Georgetown University’s Center for Security Studies. She did not respond to a request for comment about al-Marayati’s presence on the trip. 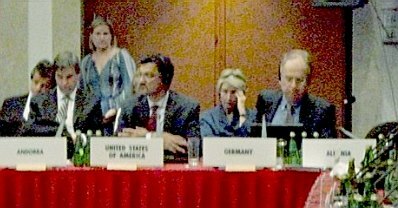 This is the fourteenth in a series of posts on this week’s OSCE “Human Dimension Implementation” meeting in Warsaw. More will be coming later this week. Wait. They haven't finished with Israel yet. Next thing you know Mossad will be blamed for the administration's - State Dept's - refusal to provide the ambassador with sufficient security. But it has enough money to buy those useless Chevy Volts. 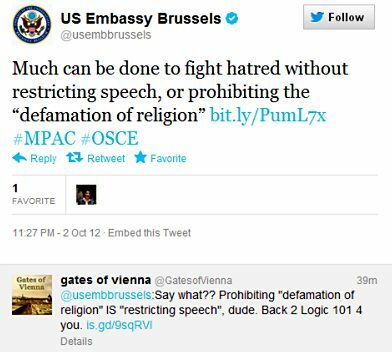 This whole OSCE thing is a set-up. I admire Elisabeth and the dissident crew who showed up to let in some sunshine in Warsaw. Are other Americans on that delegation also insane truthers? I cannot believe that the country of the Constitution, freedom of speech and religion has allowed a muslim to represent us in anything, much less an international meeting. Obama, our muslim-in-chief and his leftist thugs must be thrown out this November, and with gusto!!! In any case, what was a "Muslim Public Affairs Committee" spokesman doing representing the US government?! Is this consistent with the "separation of church and state" that the US government always claims to abide by?? While I cannot verify 'Truther', there is at least one 'Brother' more, which is plenty bad enough. Alex Johnson is the name, Bashy Quraishy applied the title, repeatedly and personally. We should have a closer look at this guy.